Modification of graphene has been undertaken in many research contexts in order to improve its properties. In this study, we examine Ni-nanoparticles decoration on graphene and its effect on sodiumion battery performance. A definite trend is observed on the relationship between Ni-nanoparticles concentration (and hence size) and battery performance. Comparable capacities on the order of 420 mAhg1 after 20 cycles at 100 mAg1 is observed for the 3 relatively high Ni-concentration samples NiC10, NiC40, and NiC80. 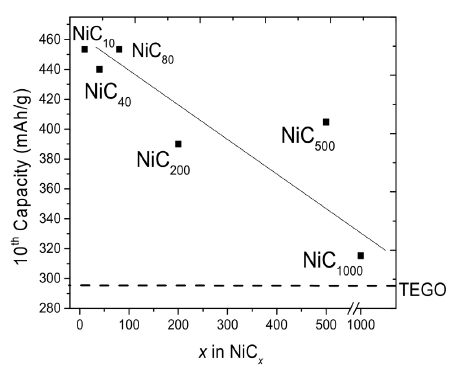 As the Ni:C ratio decreases, a decreasing trend is observed in the measured capacity, with NiC200, NiC500, and NiC1000 producing capacities of 350 mAhg1, 380 mAhg1, and 300 mAhg1 respectively after 20 cycles at the same rate. Ex situ energy dispersive X-ray spectroscopy, scanning, and transmission electron microscopy shows the morphology of the Ni-nanoparticles decorated graphene and assists in quantifing their sodium content, emphasizing the increasing sodium content with increasing Ni-nanoparticles concentration. This systematic study details how Ninanoparticles concentration on graphene surfaces can be manipulated to enhance electrochemical performance, and that higher concentrations up to NiC10 favour better performance. For a compromise between performance and cost (Ni cost), the best composition is NiC500 which favors best performance with the least Ni decoration. This entry was posted in Batteries, Graphene. Bookmark the permalink.